Is Golan Heights part of Syria? 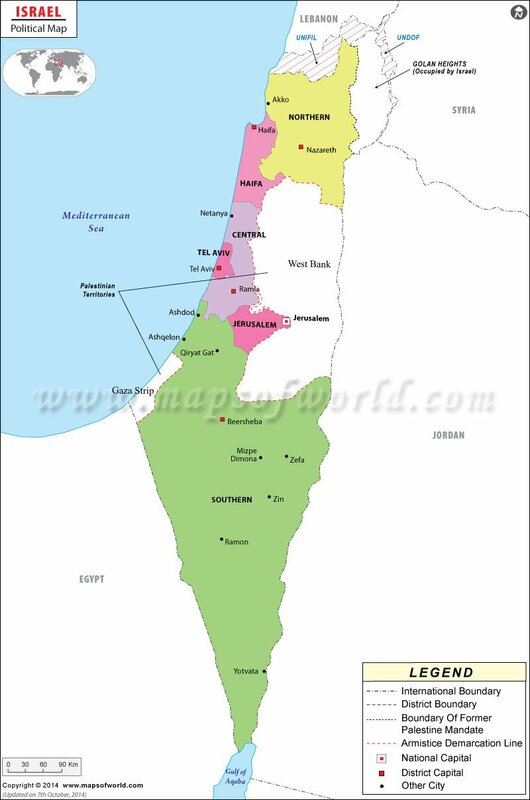 Israel political map provides in details the locations of various important places and cities of Israel. This middle-eastern country is located on the latitude of 31° 30' North and longitude of 34° 45' East. Gaza Strip, West Bank, Egypt, Lebanon, Jordan and Syria border the country. Israel is a nation located in the Middle East, along the eastern Mediterranean Sea. Israel shares borders with Lebanon, Syria, Jordan, the West Bank, Egypt, the Gaza Strip, and the Gulf of Aqaba in the Red Sea. Often referred to as the Holy Land, Israel is an important center of the Abrahamic religions, which include Judaism, Christianity, Islam, and Baha'i. Referred to as the "promised land" in the Hebrew Bible, the Kingdom of Israel has a very long history, with civilizations dating back to the second millennium BC. Israel is a Jewish and Democratic State, and the only Jewish-majority state in the world. The official languages of Israel are Hebrew and Arabic, and its population is about three-quarters Jewish and about 20 percent Arab. The total population of Israel is almost 8 million people, and its population has one of the longest life expectancies in the world on average. Israel's capital is in the historic city of Jerusalem, which has a population of about 800,000. The highest point in Israel is Har Meron and the lowest point is the Dead Sea.